Acne occurs when hair follicles become plugged with oil and dead skin cells. Hair connected to sebaceous glands. These glands secrete an oily substance known as sebum to lubricate the skin and hair. Sebum typically moves upward along the hair, and then through the openings of hair follicles on the skin surface. When your body produces excessive amounts of sebum and dead skin cells, the two can accumulate in the hair follicles and form together as a soft plug, creating an environment in which bacteria can thrive. This plug may cause the follicle wall to bulge and produce a whitehead. Or plug-in can be open to the surface and may darken, causing eel. Pimples are raised red spots with a white center that develop when blocked hair follicles become inflamed or infected. Blockages and inflammation that develop deep inside hair follicles produce lumps beneath the surface of your skin called cysts. Other pores in the skin, which are openings of the sweat glands in the skin, typically do not participate in acne. 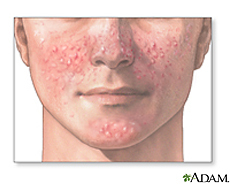 Acne is usually not a serious illness. But you can seek medical help from a dermatologist for persistent pimples or inflamed cysts to avoid scarring or other skin damage. If acne scars and it may affect your left social relationships or self-esteem, you can also ask a dermatologist if your acne can be controlled or if your scars can be reduced. Acne treatments work by reducing oil production, speeding up skin cell renewal, fighting bacterial infection, reducing the inflammation or doing all four. With most prescription acne treatments, you may not see results for four to eight weeks, and your skin may get worse before it gets better. Your doctor or dermatologist may recommend prescription medication you apply to your skin (topical medication) or take by mouth (oral drugs). Oral prescription acne should not be used during pregnancy, especially during the first trimester. Over-the-counter topical treatments. Acne lotions may dry up the oil, kill bacteria and promote shedding of dead skin cells. Over-the-counter (OTC) lotions tend to be mild and include benzoyl peroxide, sulfur, resorcinol, salicylic acid or sulfur as its active ingredient. These products can be very useful for mild acne. OTC acne can cause initial side effects - such as skin irritation, dryness and peeling - often improved after the first month of therapy. Topical treatments are available by prescription. If your acne does not respond to OTC treatment, consider visiting a doctor or dermatologist to get a stronger prescription lotion. Tretinoin (Avita, Retin-A, etc. ), adapalene (Differin) and tazarotene (Tazorac, Avage) are examples of topical prescription products derived from vitamin A. They work by promoting cell renewal and prevent blockage of the hair follicles. A number of topical antibiotics also available. They work by killing excess skin bacteria. Often, a combination of products needed to achieve optimal results. A number of antibiotics and benzoyl peroxide combined preparations available, including various dose combinations of benzoyl peroxide and clindamycin (BenzaClin, Duac, Acanya) and benzoyl peroxide and erythromycin (Benzamycin). Dapsone gel (Aczone) is a new acne treatment, it is particularly effective in the treatment of inflammatory acne. Recipe topical acne treatments can cause skin side effects such as stinging, burning, redness, or peeling. Your doctor may recommend measures to minimize these side effects, including using a gradually increasing dose, flushing drugs after a short application or switching to another drug. antibiotics for moderate to severe acne, you may need a short course of oral antibiotics prescription to reduce bacteria and fight inflammation. Since antibiotics were first used to treat acne, antibiotic resistance has increased significantly in people with acne. For this reason, your doctor will probably recommend these drugs to decrease as soon as your symptoms begin to improve, or as soon as it becomes clear that the drugs do not help - usually within three to four months. In most cases, you will use topical medications and antibiotics together. Studies have shown that with the use of topical benzoyl peroxide along with oral antibiotics can reduce the risk of developing resistance to antibiotics. Antibiotics can cause side effects such as upset stomach, dizziness, or skin discoloration. These drugs also increase sun sensitivity of your skin and may reduce the effectiveness of oral contraceptives. Isotretinoin For deep cysts, antibiotics may not be enough. Isotretinoin (Amnesteem, Claravis, Sotret) is a powerful medication available for scarring cystic acne or acne that does not respond to other treatments. This medicine is reserved for the most severe forms of acne. It is very effective, but the people who make it necessary to closely monitor the dermatologist because of the possibility of serious side effects. Isotretinoin is associated with severe birth defects, so it can not be safely taken by pregnant women or women who may become pregnant during treatment or within several weeks to conclude the treatment. In fact, the drug carries such serious potential side effects that women of reproductive age should participate in the Food and Drug Administration-approved monitoring program to receive a prescription for medication. Isotretinoin often causes side effects - such as dry eyes, mouth, lips, nose, and skin, as well as itching, nosebleeds, muscle aches, sun sensitivity and poor night vision. The drug can also increase the levels of cholesterol and triglycerides in the blood, and may increase levels of liver enzyme. In addition, isotretinoin may be associated with an increased risk of depression and suicide. Although it is a causal relationship has not been proven, doctors remain on alert for these signs in people who are taking isotretinoin. If you feel unusually sad or unable to cope, while taking this drug, tell your doctor immediately. Oral contraceptives. Oral contraceptives, including a combination of norgestimate and ethinyl estradiol (Ortho Tri-Cyclen, Previfem, etc.) may improve acne in women. However, oral contraceptives may cause other side effects - such as headaches, breast tenderness, nausea and depression - what do you want to discuss with your doctor. The most serious potential complication is a slightly increased risk of cardiovascular disease, high blood pressure and blood clots.